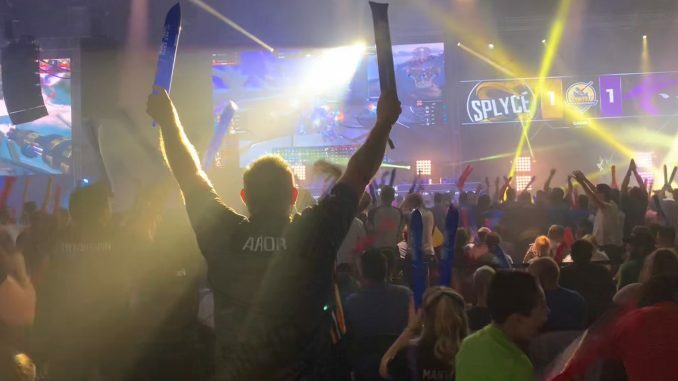 Splyce fans go wild after the team's Game 2 win. 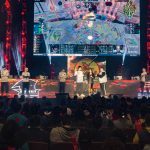 Almost a year of play comes down to this: the $1,000,000 SMITE World Championship Final at Hi-Rez Expo. 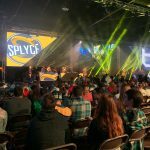 This year there are two 2018 Champions, as EUnited won the title in January, and North American team Splyce won it at DreamHack Atlanta today. An epic five game match decided the Season 5 Final. Here’s a look at how it all went down. Team Rival come out swinging, with Vote getting the first kill on Cyno. The team kept picking one on one fights around the map in the first minutes of the game, showing their aggression early on. Deathwalker on Amateratsu stalked down the right side of the map, challenging Divios on Kuzenbo as often as he could, but Cyno jumped into the lane on 9 minutes to pick up a key double kill on Deathwalker and iceicebaby to get Splyce back into the early game. 15 minutes into the game Team Rival started up the Gold Fury, inviting a team fight and Cyclonespin was the one to jump in and start things up for Splyce. The teams traded kills, with a big win coming for Splyce who managed to finally take out Deathwalker after he kited the entire team around the map before finally dying. An 18 minute Fire Giant by Team Rival caught Splyce by surprise and the EU team went charging up the middle to take out the towers and the phoenix there. From there, Splyce had a tall mountain to climb to get back into the game. Their only hope was to somehow take the Fire Giant and win fights in the jungle in order to chip away at Team Rival’s considerable lead. Rival got to the FG first, and one by one, Splyce challenged the better leveled team as they tried to harry them away from the objective. It didn’t work. Rival swatted away the Splyce players, took the Fire Giant and then marched toward the opposite base. Splyce were waiting for them there, and mounted a serious defensive front to keep their Game One hopes alive. Temporarily stopped, thanks to a massive kill by Moswal on Vote, Rival retreated to lick their wounds and prepare for another charge. Splyce played aggressively out of their base, continuously pushing Rival back on the left hand phoenix. Rival finally took down the phoenix and immediately backed off, respecting Splyce’s ability to win big fights and then use the long respawn time to win the game. Finally Rival managed to get past Splyce to their titan on the back of yet another desperate team fight, winning a hard fought game one. Aror gets the first blood on Vote and Splyce match Rival’s aggression from the first game to start the match. Cyno’s Ne Zha takes out Deathwalker a few minutes later. Rival answered back with a slew of kills of their own in a team fight to even things up. Iceicebaby’s Pele was unstoppable, racking up 5 kills in under 12 minutes. On Splyce’s side, Cyclonespin’s Freya rotated well to pick up two kills during a team fight in mid and the NA team worked well together to stay in the match moving into the late stages of the game. 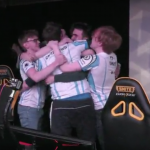 After both teams lined up at the Gold Fury, Rival looked like they were going to take the objective, but Splyce forced a fight and won on the back of Cyclonespin’s antics, tying up the game. The level of play between the two teams was incredibly high. Teamfight after team fight happened in mid, with the teams trading kills and Splyce maintaining a slim lead. Then things got out of hand very quickly, as Splyce took the Fire Giant and then stormed down the map and straight into Rival’s base to take an emphatic win. 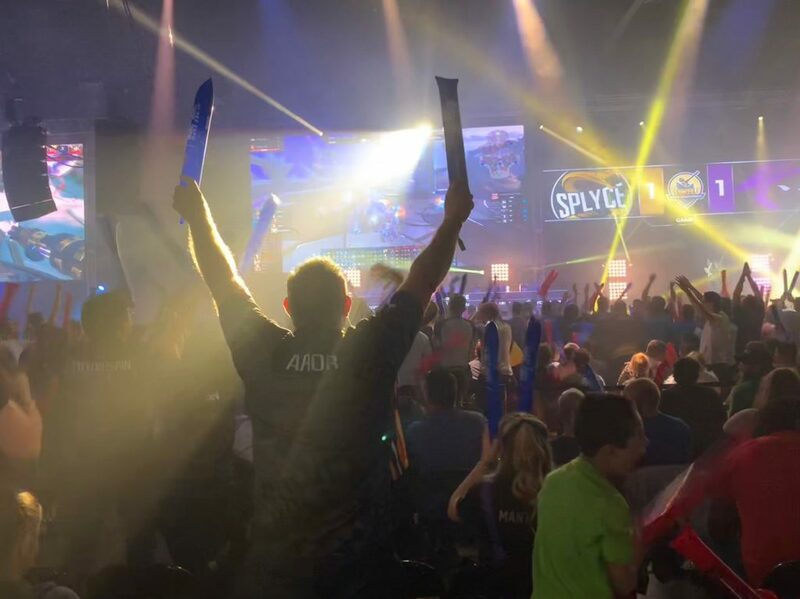 Splyce fans go wild after the team’s Game 2 win. It’s now essentially a best of three match from here on out, with Splyce and Rival both showing their early aggression in the first two games. 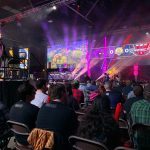 The picks for Game Three were stacked for a late game battle and both teams opted to start the match a little slower, forgoing the early one on one fights in favor of farming. Vote also surprised the crowd by picking Cupid to float down the left. Deathwalker strayed into the jungle on 8 minutes and got caught by Cyno for the first blood. A minute later, the first real team fight of the match went the way of Rival as they picked up two kills to Splyce’s one. 16 minutes in Deathwalker was caught in a 1 v 3, buying time with his life for his team to take the Gold Fury while Splyce celebrated the kill. That’s how the teams were playing in the mid-game – Splyce playing for kills while Rival played for objectives. Ultimately the competing strategies worked well for both teams, with Rival maintaining a small gold lead. Rival played defensively for most of the game, remaining on the back foot while Splyce took the Gold Fury and the Fire Giant at 24 minutes. Splyce went on to threaten Rival’s base by taking out the left side phoenix, then went back to get another Fire Giant while Rival were forced to concentrate on defending their remaining phoenixes. Rival just couldn’t hold on and amid the crowd’s “USA” chants, Splyce fought off the opposing players and took the Titan for the win. Iceicebaby’s Ne Zha was caught out of position in the 4th minute and Moswal got first blood for Splyce. The North Americans continued to play aggressively and but not foolishly like they did in the third game, baiting Rival into fights around the map. Splyce take the Gold Fury just inside of 16 minutes without much interference from Rival, who were still trying to recover from earlier team fights. Divios frustrated Deathwalker on the right, refusing to die quickly, so Deathwalker couldn’t pick up the kills he’s used to getting in the early game. Rival got back in the game on 18 minutes with a massive team fight that claimed the lives of four Splyce players, thanks in large part to a rampaging Wlfy with Raijin who picked up two kills. The team then went on to take the Fire Giant and took out Splyce’s T1 towers. 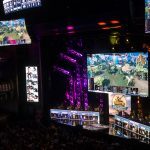 At 24 minutes, Rival had a firm lead when Splyce instigated a fight near the Fire Giant but Rival turned the tables on the NA team, winning the fight and then taking the objective. 15-8 was the kill count at 28 minutes with Wlfy continuing to carry the team with 10 kills. Rival made a base charge at the half hour mark, took out the left side phoenix and then turned tail with Splyce hot on their heels. Minutes later, another Fire Giant went the way of the EU team, and they rushed over to take out Splyce’s right side phoenix. Splyce then went on the offensive just outside their base, with Aror’s Fenrir charging in to take out Deathwalker and put a stop to Rival’s efforts to close out the match. Rival opted not to attack again even though most of the players still had their ultimates, and fell back to try to get another Fire Giant and another team fight. As the game wore on, Splyce grew stronger, taking out a tower and getting some much needed confidence. Splyce took a chance and went for Rival’s middle phoenix after taking out Deathwalker in a fight, but they just didn’t have the damage to take out the objective, and backed for Rival to take the Fire Giant once again. 45 minutes in, and Rival decided to abandon the siege offense and got for a 4-1 split push. The tactic worked somewhat, with the left phoenix going down, but Rival still lost Deathwalker in the battle and had to fall back yet again. Six Fire Giants. That’s how many buffs Rival needed to finally make it into Splyce’s heavily defended base. The EU team forced a Game 5 by finally getting two phoenixes down and going for the Titan. It all came down to this last game! Each team started off minding their own business, staying in their lanes and quietly taking out minions. At 5 minutes, Wlfy took out Aror but was cleaned up by Moswal to start the kills for the match. The first Gold Fury of the game went the way of Splyce in just under 12 minutes, and the teams remained close in kills, gold and experience. 17 minutes, and Splyce are playing the way that Rival played in Game One: slow and steady, prioritizing objectives while Rival chase them down. Splyce took the Fire Giant on 20 minutes and then charged up the middle lane toward the phoenix. Rival chased them out of their base in the end, but it was a gutsy move from Splyce to jump in and take control of the game. 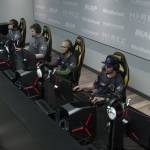 24 minutes in, and Splyce still have the lead but Rival are making inroads by taking the Gold Fury and preparing for a battle over the Fire Giant. Splyce take the FG, and move up the middle lane to get the phoenix again. Rival beat them back once again, and Splyce look for another chance to win the game. Splyce take out the left hand phoenix and push into the base for the match win! Cyno wins the MVP Award for his work harrying his opponents all around the map during the series. Splyce were at the bottom of the League after the Spring Split, but the team credited their new synergy to living together in a team house in New Jersey for their epic turnaround. For Rival, it was a heartbreaking loss to an NA team once again. Find out what’s in store for SMITE in Season Six, here.